Celebrating Chinese New Year at the House of Windsor! Yes I know, it's a terrible pun! Koi Carp are very popular in Chinese and Japanese cultures infact the word "koi" actually means "carp". So the name "koi carp" is in fact "carp carp", which is carping on a bit. On a walk around our new condominium we came across the "Koi Carp Pool" referred in the apartment's promotional literature. The fish in question are quite beautiful as they swim lazely in the direction of the currents produced by the pond's aeration system. Being a cold water fish they prefer a deep pool and we seem to have a predominance of the Kohaku variety which has a white body with red patterns. An adult Koi grows to about a metre in length and ours are probably three quarters of that length and must be very valuable. The Japanese have become fantical breeders of Koi and have named many colour variations. They are symbols of prosperity in Japanese culture, so judging from the stocking ratio of our pool I should be a wealthy man in the very near future, unless of course I have to share my good fortune with the other 721 residents of the apartment complex. Not that I am tempted to breed Koi myself, as investing in a Cyprinus carpio is similar to investing in a marriage - the average lifespan of koi can reach over 50 years, with the longest lifespans over 100 years. First night in the new "condo" and the body is aching from the unaccustomed physical exertion. Fortuitously there is a gym in our Queens complex so I think it’s about time I got back to an exercise regime. The last time I ventured into such a place the exercise machines were far less complex than they are now. Modern machines have so many dials, gauges and knobs that a pilot's license is needed before setting foot on a treadmill or exercycle. The other disturbing thing about modern gym equipment is the plethora of health signage and lights that appear when one's body fat index reaches critical mass. Signs that your blood pressure could explode like an over-ripe durian (if you overdo it) are everywhere and none too comforting. 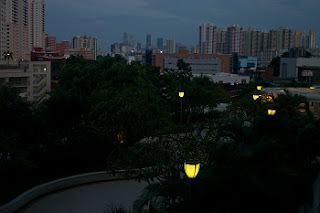 The view of Singapore in the evening is very pleasant, with the commercial and HDB building twinkling in the distance. The new shower has been tested and found to be satisfactory while the computerised washing machine has automatically weighed the washing, suggested the amount of soap powder to be used and started of its own accord. Singapore has some wonderful electronics and appliances available for purchase, many of which are models that have yet to reach the Antipodes. The competition is fierce and so sales are often sweetened with "offers". For example our purchase of a 32 inch Samsung LCD television resulted in a bonus home theatre system plus vouchers worth several hundred dollars to spend at the local Robinsons department store. I suspect we will literally be dining out on free supermarket vouchers for the next month. It's a Saturday and this particular day of the week in particular is a rather special one for two reasons. Firstly I am back at work. Not an unusual occurrence in Singapore but a first for me for many years. 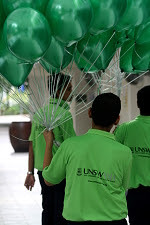 We are about to stage the university's first public Open Day and the official opening of the institution in Singapore. Most of the official formalities are being held in the library and so our team are supporting wherever necessary. The officiating dignitary is the Minister of Education, Mr. Tharman Shanmugaratnam. He also happens to be the second Minister of Finance so is important on two counts. Some of today's highlights will include a traditional Lion Dance and an "Ozzie Barbeque" for lunch. Questioning reveals that this will not be the traditional "Ozzie BBQ" as most of us know it, as there is to be no beer and no cricket blaring from a television. Staff are resplendent in their bright green sweat shirts (see photo left) and visitors will receive a "goody bag" of similar hue. One is reminded of an invasion of 'Kermits' as they scurry around in preparation. The second reason that this is an important day is that we are currently in transition between our current rented apartment and our new condominium. The renovations are and the first lot of new furnishing and appliance arrive tomorrow. It is needless to say a very tiring time, neither living in one place or another and it will be good to have this shift out of the way by Wednesday evening. One final note on 'being green'. The price of greens and other vegetables has risen sharply in recent weeks as a direct result of the severe flooding in Malaysia. Singapore sources most of its vegetable from its immediate neighbour and has now been forced to buy from China and other countries. There is a certain solemnity about traffic accidents. It reminds one of the frailty of the human body and how one life experience can be so quickly changed to another. I mention this because as I was travelling home in a cab Thursday evening we came across a scene of personal tragedy involving a motor cyclist and a car that had hit him while trying to run an intersection. This event had happened only a few moments before we arrived on the scene and already several passers-by had rushed to the prone man's aid as he lay, clad in cycling leathers, near the middle of the road. If ever I needed a reminder just how dangerous riding a motorbike can be, this was it. This is very much the case in the torrential downpours that are experienced here where the road can get very slippery in a thrice. It is not uncommon to see huddles of cyclists under overbridges on the expressways as they don their wet weather gear, in the face of an advancing storm. In a far more cheerful vein, we spent much of yesterday visiting our apartment, which is being renovated. The good news is that it will be ready for us by next Thursday. On the strength of this information we swung into action and with credit cards flashing, descended upon 'Bests' which is the local chain of stores that sell electrical and households goods. Several thousands of dollars later we staggered out and then set about alerting removal men, the local Telco's and everyone else who needs to be notified of our impending shift. One quick visit to the local Police station with our identity cards meant that our new address was recorded. They in turn will alert all government departments on our behalf. If only Singtel could emulate the local constabulary's efficiency! I have taken an aversion to nonsensical marketing statements, even though I spent many years in marketing myself and can appreciate the value of a good slogan or tag line. A quick walk or bus ride around Singapore reveals many examples where the English language has either been completely mangled, or abbreviated to such an extent that the original context of the sentence or statement becomes totally obscure. This morning as I sat on the 111 bus I was invited to "Blend into the intersection of work and play" on a large billboard announcing yet another condominium development. I would have thought that the concept of "blending into intersections" was promoting an activity that is fraught with danger. At Christmas, a Japanese manufacturer implored me in tinseled tones to “Celebrate the Real". The real 'what' was never explained and the value of such open-ended statements has to be questioned. (I never did by my new vacuum cleaner from this company). The concern for the 'mangling' of the English language has even moved to the local newspapers. 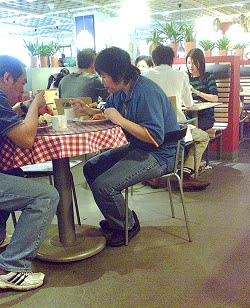 There is a regular column in the Straits Times dedicated to the worst examples on view in public places. In far more humorous vein is the The Coxford Singlish Dictionary , a part of the satirical site, TalkingCock. It contains some good writing and ribald commentary and is not for the faint hearted, but fun never the less. How could we ever forget such eloquent lyrics as: " Chiquitita, you and I know, How the heartaches come and they go and the scars they’re leaving" or "Ring, ring, why don’t you give me a call? Ring, ring, the happiest sound of them all" ? While not the greatest of verse, it creators, ABBA, were certainly one of Sweden's most successful exports. In Singapore there is another such export with Swedish connections- in a word, Ikea. As I have always enjoyed Scandinavian design it has been a great relief to discover low cost furniture with good design principles and of a scale that is suitable to modern apartment living in Singapore. Not only does the local populace flock to Ikea every weekend they also have taken a shine to the restaurant offerings such as Chicken Wings and Swedish Meatballs (see picture). The meatballs in question vary little in design from the traditional English Meatball but are noticeably smaller. Lucky I was wearing my reading glasses at time of ordering or I might have missed them on the plate. Ikea is no 'Johny Come Lately' on the Singaporean scene - it has been here for the past twenty eight years. At the end of 2006 it opened an even bigger megastore at Tampines and did do with a traditional wood cutting ceremony. Knowing the efficiency of the Swedes, it is quite possible that the table we decided to purchase yesterday was recycled from the same ceremonial log. And being the third day of the New Year it's back to work in Singapore, which is a bit of a wrench to the system as we Antipodeans are used to long and balmy summer vacations. Mind you, I never took a long holiday in New Zealand at this time preferring instead to escape the coldness of winter mid year. I mentioned in my last entry that we had visited the Presidential residence, Istana. What I neglected to say (and what many Singaporeans are unaware of) is that the grounds of Istana have been very successfully converted into what appears to be a nine hole golf course. Undoubtedly this landscaping intervention happened in recent years as it's hard to image Queen Vic's representative putting a round in his plus fours! An entry on the Istana web site indicates that the grounds became a public park in the 1960's but the provenance of the golf course itself is not stated. The sloping nature of the fairways reminds me of an uphill New Guinean airstrip. Many of the latter had very steep inclines which made it necessary for planes to land uphill and take off downhill - to gather speed before a precipitous drop at the end of the runway. Each Istana green was roped off and under the watchful eye of the local constabulary when we joined the Open Day multitudes. Given that Istana is only opened rarely to the public, one can only wonder who makes regular use of the links? Most enthusaists would agree that golf is a game that should be given up at least twice a month! Today we took possession of our new condominium. It's feels good to be a 'man of property' again although we won't move in until our rennovations have been completed. It looks as if we will be able occupy the apartment before Chinese New Year which is good news. The bad news may come tomorrow when we learn what the costs of the minor works is likely to be.